Catechin-Rich Tea is made of the highest quality pesticide-free tea leaves that are harvested in highland of Shizuoka, Japan. Catechin-Rich Tea contains active natural ingredients called Catechin (Polyphenol of Green Tea) and numerous vitamins, such as vitamin B2, vitamin D, vitamin K and beta carotene, as well as a well-balanced mineral content by using green tea leaves of autumn crop. Catechin, the active ingredient in Catechin-Rich Tea, can bind with nitrogen and sulfur compound in your mouth to help eliminate bad breath. Catechins can effectively sterilize the bacteria in your mouth that cause cavities, and also helps destory periodontal bacteria, which cause periodontal diseases. Catechins have been clinically proven to fight different viruses, slow aging and improve general health. Catechins destroy free radicals, which are highly reactive molecules that can damage the body at a cellular level leaving the body susceptible to cancer, heart disease and many other degenerative diseases. Catechins affect the viruses that cause the common cold and influenza. Catechins are also able to prevent heart disease by lowering blood pressure and suppressing "bad" cholesterol. Catechins inhabit the breakdown and absorption of glucose in the small intestine, helping prevent blood sugar levels from excessively increasing. A. Taking two to three tablets, chewing and dissolving them in your mouth, three times a day, is recommended. When and how is the most effective consumption? A. It's best to chew two to three tablets after each meal in order to preserve the mouth's cleanliness. A tablet can also be chewed when you first wake up in the morning as that's when bacteria are most abundant in your mouth. Taking one tablet, like a candy, allowing it to dissolve solely in the entire mouth, will induce saliva degradation for anti-bacterial effect. I drink lots of Green Tea every day, isn't that good enough? A. If you drink tea using teapots, 70% to 80% of the effective substances are left in the tea leaves. Although it is recommended to drink 8 to 10 cups of strong green tea every day to obtain benefits, this quantity is hard to swallow even tea lovers. Also, you can replace the benefit of chewing a Catechin-Rich Tea tablet directly in your mouth with drinking green tea. I don't like the bitterness of Catechin-Rich Tea tablets. Do I have to chew it? A. We recommend chewing on the tablets as much as possible, as our Catechin-Rich Tea tablets are manufactured with minimal bitter Catechin taste while preserving the intrabuccal sterilizing effect. There are many cases of those who claim that the taste was bitter at first, but over time have become used to the taste. For those who find the bitterness really too strong, drinking it down with water is alright as well. All of the healthy benefits can be obtained, except for the mouth hygiene effect. Can Catechin-Rich Tea tablets be consumed while taking prescriptions from a doctor? A. Depending on the medication, Catechin-Rich Tea tablet may or may not be consumed with a prescription. You should always consult a doctor or a pharmacist if you are on any medication. A. No, there are no dangers of side effects in what is considered to be "normal" consumption amounts. However, depending on your physical constitution, you may need to visit the washroom more often due to its diuretic effect. For health purposes and maximum benefit, a limit of 12 tablets a day is recommended. What are the Ingredients of Catechin-Rich Tea Tablets? A. Japanese Green Tea had been widely recognized as the drinks for health from ancient. Recent studies to Japanese Green Tea get the numerous scientific effect to the body. These efficiencies are coming from the Catechins, the ingredients of green tea. Japanese Green Tea have the eight different form of Catechin. These are Catechin (C), Epicatechin (EC), Gallocatechin (GC), Catechin Gallete (CG), Epicatechin Gallete (EG), Gallo Catechin Gallete (GCG), and Epigallocatechin Gallete (EGCG). Main ingredient is EGCG, and others are EC, EGC, and EG. EGCG hold about 55 – 60 % of the total Catechins, but the taste is very astringency. Generally, Catechins are easily able to degenerate and degrade by high temperature (over 162°F) in the process of production, especially in the boiling to extract. Ours tablets were made under the best Quality Control on the low temperature without any degeneration and degradation in world-wide patent process, so we can get the natural form of Catechins in the mouth. What is about the green tea that we used to make "Catechin-Rich Tea"? A. There are three different "curing process" of the tea in the world. From the ancient age, tea have been drinking to enjoy the taste and flavor. These three tea have the different taste and flavor by each curing process. But, recent study in laboratory found that Green Tea had the strong power to keep the human's health. Almost all of these study found that the polyphenols or catechins, the contains of tea, is working to the body. And, we know, green tea contain the pure natural form of polyphenols compare with others. Because the form of polyphenols will degenerate, and/or degrade by high temperature in curing process of fermentate. We can find this by color of tea, dark brown. And also, many of green tea extract had the dark brown color, this mean high temperature was used in the process. We better to doubt the form of catechins is natural or not. 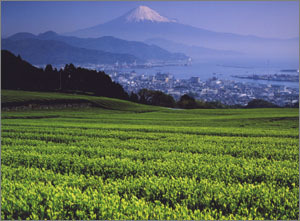 In general, Japanese green tea have the three different seasons of harvest. New leaf in spring – the best taste and flavor. Second harvest in summer – the second best taste and flavor. Third harvest in autumn – the rich of catechins after summer sunshine. "Catechin-Rich tea" is made from above third harvest green tea – "Autumn-crop". 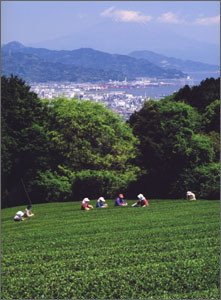 And our tea was harvested in Kawane-Cho, the highland of Shizuoka, Japan, under the pesticide-free. The process of making tablets is world-wide patented process with keeping the natural form of green tea, so its taste is very good for chewing and biting in the mouth as it like the same with green tea. It also contains natural form of Catechins ( C, EC, GC, CG, EG, GCG, EGCG ) plus numerous vitamins and mineral. This is very strong advantage to get the full of green tea's efficiency to our body. We recommend to check the some points to buy the green tea products in the market. Green tea or black tea ( or Chinese tea ). The season of harvest, Autumn-crop is best. Process of product, low temperature, not distillation. Color - green, not brown. Taste – green tea taste.